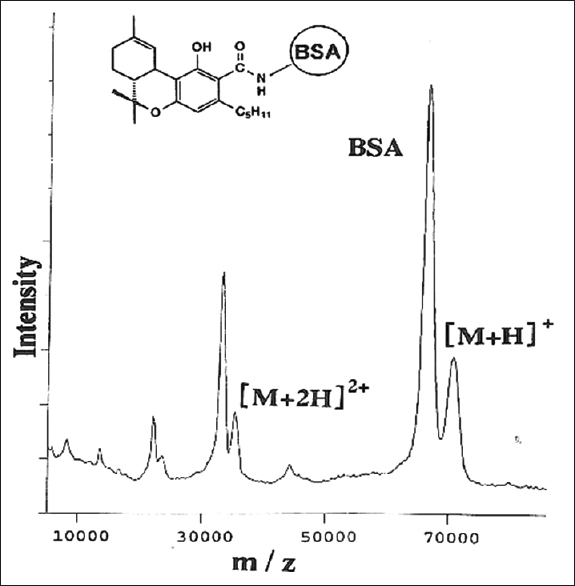 Objective: To synthesize orally bioavailable artemisinin dimers and the evaluation of their in vivo antimalarial activity. 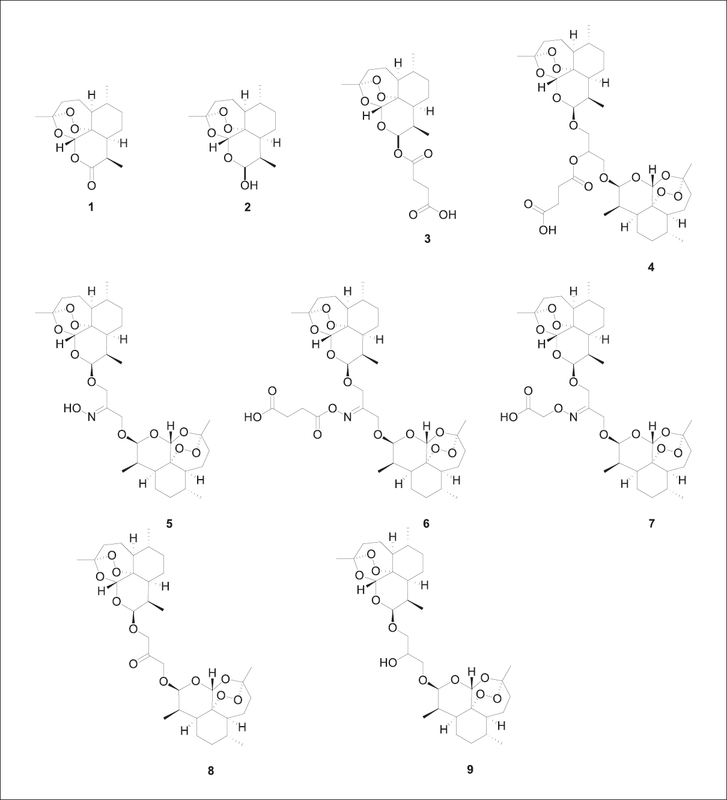 Methods: Artemsisin dimers were synthesized and their antimalarial activity was determined in in vitro and in vivo studies (administered orally and IP). Results: Dimers 5 and 6 provided 100% suppression of parastemia throughout the oral administration study, with all animals surviving up to day 28 (the last day of the study). Conclusion: Dimers 4-7 displayed markedly improved in vitro activity against P. falciparum, while the in vivo activity against P. berghei was highly encouraging, with 5 and 6 completely clearing parasitemia from the start of the drug treatment until the end of the study (day 28). Background: The Qing'e formula (QEF) is a well-known traditional Chinese prescription that has been clinically employed for treatment of bone disease for hundreds of years. Objective: The present study aims to observe the effects of different compatibilities of QEF on the scopolamine-induced learning and memory impairment in the mouse, and further to explore its action mechanisms and compatibility rationality. 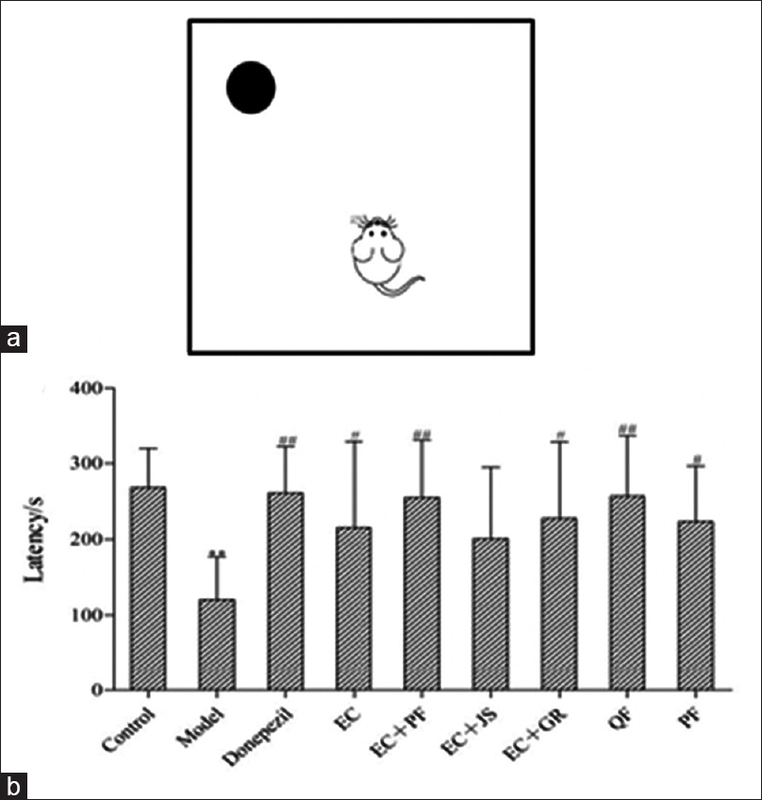 Materials and Methods: The learning and memory alterations in the mouse were evaluated using the step-down test and Morris water maze (MWM) test; the acetylcholinesterase (AChE) activity and brain-derived neurotrophic factor (BDNF) expression in the hippocampus were measured using colorimetric method or immunohistochemistry. Results: The results showed that different compatibilities of QEF significantly prolonged latency in the step-down test, shortened escape latency in the navigation test, increased the percentage of residence time, and the percentage of swimming distance in the target quadrant in the probe trial session. In addition, our results also found that different compatibilities of QEF remarkably inhibited AChE activity and increased BDNF expression in the hippocampus of mice. What's more, the group after being treated with whole recipe (QF) showed the highest level of improvement. Conclusions: These findings not only suggest that QEF may effectively ameliorate cognitive deficits through inhibiting AChE activity and increasing BDNF expression in the hippocampus but also elucidate the rationality of QEF. Monoclonal antibodies (MAbs) against natural products with low-molecular weights have become an important tool when combined with other analytical systems. Eastern blotting involves a typical staining system wherein, for example, glycosides can be blotted to a membrane and cross-linked and stained using MAbs. An immunoaffinity column combined with a monoclonal antibody allows a one-step purification of hapten compounds or preparation of a knockout extract that removes only the target hapten molecules from a crude extract. Here, we discuss the application of these extracts. Single-chain variable fragment (scFv) proteins have led to novel assay systems such as fluobodies or antibodies coupled with green fluorescent protein for natural products. A typical novel application of a scFv gene would be in the context of plant breeding; this is designated “missile-type” molecular breeding, intended to increase hapten molecule concentrations in transgenic plants. Traditional Chinese medicine (TCM) is a distinct medical system that deals with the life–health–disease–environment relationship using holistic, dynamic, and dialectical thinking. 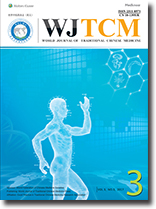 However, reductionism has often restricted the conventional studies on TCM, and these studies did not investigate the central concepts of TCM theory about the multiple relationships among life, health, disease, and environment. Complex network analysis describes a wide variety of complex systems in the real world, and it has the potential to bridge the gap between TCM and modern science owing to the holism of TCM theory. This article summarizes the current research involving TCM network analysis and highlights the computational tools and analysis methods involved in this research. Finally, to inspire a new approach, the article discussed the potential problems underlying the application of TCM network analysis. Herbal medicines, including traditional Chinese medicines (TCMs), have been used in Eastern countries for treating diseases such as cancer for thousands of years. With the growing knowledge of tumorigenesis and cancer therapy, some natural compounds have been developed as clinical anticancer drugs. In addition, many compounds and TCMs have been characterized as complementary and alternative treatments, with synergetic effects on enhancing the efficacy or reducing the side effects of the therapeutics. In this review, we summarized the recent studies focusing on the combination of natural compounds or TCM decoction with chemotherapeutics. The detailed mechanisms of action of the combinations and the application of analytical methods on TCM development are also discussed. The objective of this study is to summarize the pharmacological effects and the mechanisms of action of Xiao Chai Hu Tang (XCHT, Minor Bupleurum Decoction) on liver diseases, so as to give relevant researchers a valuable insight and benefit patients with hepatopathy. PubMed was used to search for and collect scientific publications related to XCHT and liver diseases from 1986 to 2016. The available scientific results or evidence were read, classified, and analyzed. XCHT showed clinical efficacy in patients with hepatic diseases including hepatitis, hepatic fibrosis, and hepatoma. The mechanisms involved the production of cytokines, the regulation of immune function, the suppression of lipid peroxidation, etc., XCHT might work on the metabolism of some medications such as tolbutamide by the regulation of gastric emptying and intragastric pH. XCHT exhibited a very low toxicity profile, such as interstitial pneumonia due to duration of medication, patients' age, and drug combination. XCHT has been a eutherapeutic supplemental remedy for liver diseases. However, many mechanisms of action and effects of XCHT on new types of liver diseases still remain unclear, so more and more animal experiments and human clinical trials are needed to obtain enough proofs for the clinical use of XCHT in new types of hepatosis such as nonalcoholic fatty liver disease and autoimmune liver disease. 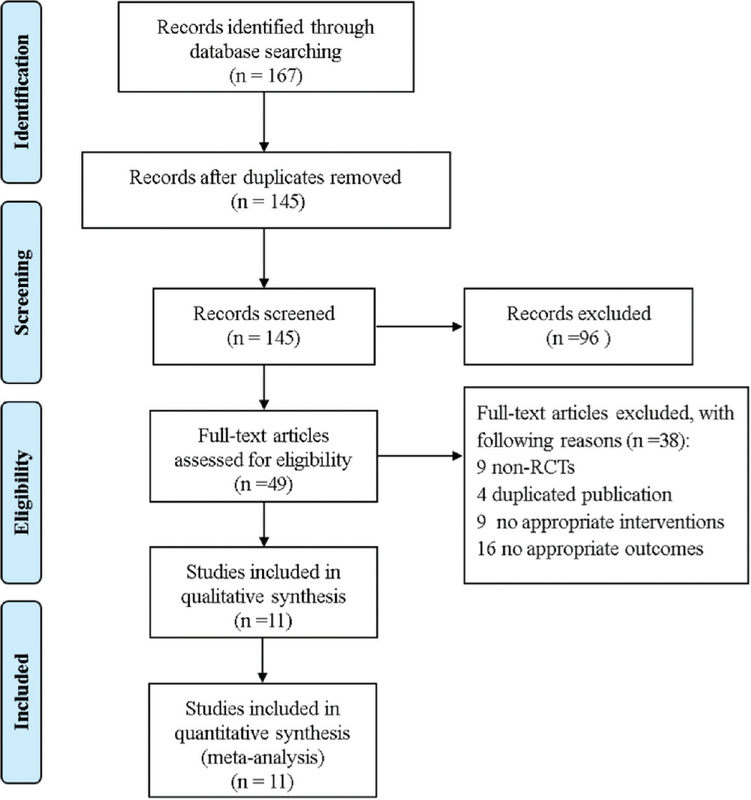 Objective: The objective of this study is to evaluate the effectiveness and safety of traditional Chinese herbal medicine (TCHM) in treatment of perimenopausal depression (PD) in China. Methods: To identify randomized controlled trials, an electronic search has been conducted through databases as follows: PubMed, the Cochrane Central Register of Controlled Trials, Web of Science, Chinese Biological Medicine Database, China National Knowledge Infrastructure Database, Chinese Scientific Journal Database, and WanFang Digital Periodicals Database. Methodological quality was evaluated by Cochrane Collaboration's tool which is able to assess the risk of bias in Review Manager Software. What's more, meta-analysis was performed by using Cochrane Collaboration's RevMan 5.2 software, (Nordic Cochrane Centre, Cochrane Collaboration, Copenhagen, and Denmark). Dichotomous data were analyzed by using relative risk (RR) and 95% confidence interval (CI). Continuous variables were analyzed using weighted mean differences (WMDs) and 95% CI. Subgroup analysis was performed by the type of medicine which was used in the experimental group. Results: This meta-analysis includes 11 randomized control trials with 818 patients. Compared to the control group (RR: 1.14, 95% CI: [1.03, 1.26], P = 0.009 and WMD: −2.09, 95% CI: [ −3.58, −0.18]), the experimental group had a significant higher clinical efficacy rate and relatively lower Hamilton Depression Rating Scale (HAM-D) score. For clinical efficacy rate, the results varied depending on the detail treatment measures of the experimental group. In the experimental group with TCHM, no significant difference was observed (RR: 1.14, 95% CI: [0.97, 1.33]), while in the experimental group combined with western medicine, a significant difference in the clinical efficacy rate between the experimental group and control group showed up (RR: 1.15, 95% CI: [1.01, 1.32], P = 0.04). For the HAM-D score, subgroup analyses revealed that the pure TCHM therapy was not associated with significant HAM-D score reduction compared to the control group (WMD: −2.48, 95% CI: [−6.00, 1.03], P = 0.17). However, in the experimental group where western medicine was added to, the HAM-D score decreased statistically compared to the control group (WMD: −1.88, 95% CI: [−3.58, −0.18], P = 0.03). There is no serious adverse event in both groups. Conclusions: Combination therapy of TCHM and western medicine is more effective in treating PD in terms of clinical efficacy rate. However, the results should be interpreted with caution due to the mediocre methodological quality of the included trials.